Need high quality audio but don’t have access to recording facilities? 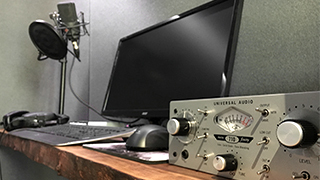 I have my own high spec, full broadcast quality recording studio, lovingly nicknamed ‘The Padded Cell’, which was custom-built to provide crystal clear, broadcast quality audio. or I can record undirected and send the resulting audio back to you, whichever you’d prefer. That walnut desk is my baby. Forget to use a coaster at your own risk. I’m usually able to turn around recordings within 24hrs but if you have an urgent project then please get in touch for my up-to-date availability.